I’m not sure what all this means, exactly. When I came into my secret laboratory bedroom this afternoon, I found these objects right in the middle of the floor! Puzzled, I began to retreat to my rocking chair to ponder the meaning of the sudden intrusion of these items into what has been, for lo these many years, a knitting-only kind of craft place. What the heck?! I asked Dharma what it all meant. She had no comment. Whoa. Where did that come from?!?! Oh, wait. Wait. Now I remember. Set the Way Back Machine for 2000. Late in my pregnancy with Danger Mouse, I finished this fine example of mediocre needlepoint. I had purchased three kits on eBay when I was sentenced to put on bed rest (for SEVEN MONTHS!!! ), finished this one and moved on to (equally mediocre, actually) knitting. 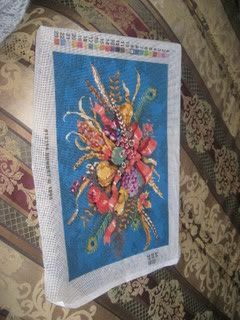 Without finishing the finished needlepoint. Hmm. 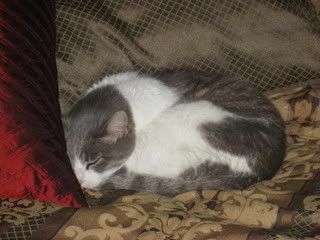 Frame, or pillow…well, I’ll get around to that eventually. Before I had knitting, I had needlepoint. I am not particularly good at it, but I do enjoy it. Like knitting, it puts me into a calm, reflective kind of mood – which is helpful, because I spend a great deal of time being about as calm, peaceful and patient as a whirling dervish. I did quite a bit of it before the knitting bug bit me, and bit me hard. After I finished the Pacific Northwest shawl, I found myself in a kind of “eh” mood, knitting-wise. Oh, I’m not going to pretend I don’t have things on the needles that I’m working on. There is always at least a dozen socks in progress, and right now I’ve got a cute little vest being whumped out for Captain Adventure (I’m using Bernat Camouflage in Blue Frost – very cute, very soft!) – the vest being a project I cast on while I thought about what I wanted to do next for real. For once, it isn’t one of those ‘too many exciting things in mind not enough time!’ issues. I’m just kind of…well. Everything is a big old ‘eh’, right now. Even digging through my stash couldn’t put something EXCITING! into my mind to make – which is really, really, REALLY odd. Seriously. If I come down with strep throat or a brain tumor next week, I will not be surprised. Then I went to my brother’s house yesterday, and because he is one of those gracious people who feels the need to do these things, there is a framed needlepoint piece on the wall – a gift I gave them back in our We Can’t Afford Salad days. 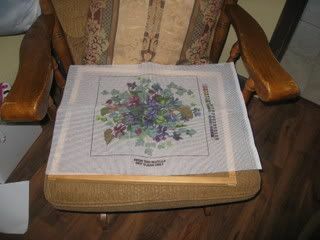 I looked at it, and chuckled, and thought, I really used to love doing those needlepoint things! I looked at it a little more closely and thought, This is actually pretty darned cute. Look at all those perfect little stitches! Shoot, I actually PAID ATTENTION when I did this one, didn’t I? The stitches were so neat and even – not too tight, not too loose, nicely ‘plump’ but not ‘flabby’. And then I thought, Hmm, don’t I still have a couple kits at home…somewhere? 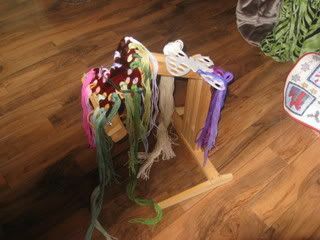 So last night I found the kits, and I removed the finished work from the frames, and sorted the yarn onto my old butterfly thread sorters, and had my husband fetch the frame holder from the storage shed and here I am. Ready to fill the void with something different. Therefore, while waiting for the new shipment of yarn I obviously need in order to stir up my creative juices, so please excuse me and my Mastercard while we head over to KnitPicks / Webs / anywhere else I can think of on such short notice this strange “all the patterns I know of are kind of boring” phase to pass…I’m gonna work me a needlepoint. good thing to fill the void with! More power to ya, lady! Needlework is beautiful but it makes my head spin. Just can't do it. However, I'm beginning to believe that you can do anything, so I can't wait to see what you do with this!